Cavaliers are now the only unbeaten team in either division of the BVI Cricket Association Twenty 20 League, after subduing upstart Road Town Wholesale in Greenland on Sunday in their Premier League matchup, ahead of a crucial encounter with defending champions Vincy. Under The Tree fell to Virgin Gorda in Division I. After opener Jagnarine Persaud was bowled for a duck, Kwesi Sinclair stepped in and put Cavaliers back on track with a timely 72 run partnership for the second wicket with wicketkeeper Gopaul Boodram, before Boodram was caught by Joel Williams for 9. Sinclair also shared a 46 run partnership for the fourth wicket with Mohamed Hassan, before he was caught by Sylvester Mitchel for 74, after being dropped twice. Captain Vishal Bharat contributed a supporting 40, helping Cavaliers to reach 234 for 8. In reply, Road Town Wholesale used their top order batsmen to carry the load, before falling short as they were bowled out for 164. Curtis Jack who went for a duck in his last outing, shared a 64 run opening partnership with Sylvester Mitchel, before he went lbw for 40, off the bowling of Dhangpaul Chrisnanand. Mitchel and Austin McDowall put on a 40 run partnership for the second wicket putting RTW back in the game, but Mitchel lifted a ball in the open arms of Drumor Tooney, for 39. That left McDowall who had 119 not out last weekend against Royal Knights to try to bring the team home, but, he was eventually caught by Chrisnanand for 43. RTW who was promoted from Division I this season, lost five wickets for a paltry 39 runs and the tail enders failed to put up resistance and they suffered their second defeat of the tournament. Cavaliers Sukdeo “Vin” Rambarose ploughed through RTW’s order, taking 4 for 24 and Mohamed bagged 2 for 4. It was Cavaliers third straight victory, their second limiting a team to under 180 runs. “We played well on all three departments, put up a good total of 234 and with the bowling we have, we can always defend it,” Cavaliers captain Bharat noted. “For the last two games, no one made over 180 against us, so we are capable of bowling teams out for less than that, so we are confident in the bowling department. 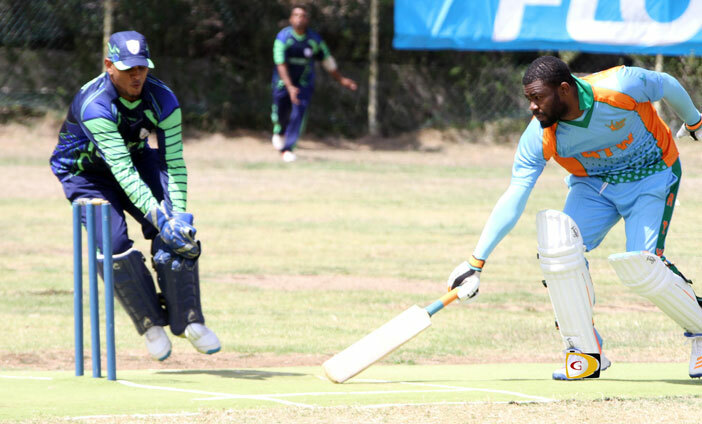 In Division I, Terry Nanton blasted his way to 98 not out in helping the Virgin Gorda Spartans to 214 for 5, knocking Under The Tree from the ranks of the unbeaten with a 74 run victory, despite a strong 91 from Under The Tree’s Emerald Prince. The Spartans’ Michael Castello, snatched 3 for 23.